An Accra Circuit Court has remanded one Anthony Kofi Mensah Azamalah, 42, into police custody for possession of firearms without lawful authority and also possessing military accoutrement. The accused whose plea was not taken, would reappear on March 8. Chief Inspector K. Adu told the court presided over by Mr Aboagye Tandoh, that complainant in the case was a military officer at the Burma camp. He said on February 7, at about 12:30pm, complainant saw the accused person at Kwame Nkrumah Circle wearing a military vest with military muffler tied around his neck, a black trousers and holding a military bag together with a walkie talkie. 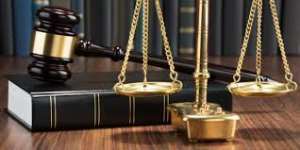 He said due to the improper way of dressing of the accused, the complainant became suspicious and confronted the accused to ascertain whether he was a military officer. He said the suspect told the complainant that he was a Warrant Officer with the rank of Class One and stationed at Burma Camp but the complainant was not convinced with his answer and collected the military bag from him. "Complainant upon search in the bag, found a Colt 9mm pistol, made in England with three live ammunitions in the pistol holster, a Ghana Army crown, desert boots, handcuffs with a key and several phones in the bag, '. The accused was arrested with the assistance of two police officers and sent to a police station.